McDonald's (MCD) had offered to pay $3 refunds to customers who purchased drinking glasses decorated with characters from the most recent Shrek film, Shrek Forever After. 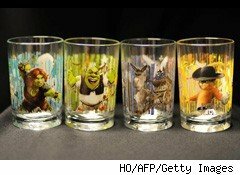 The fast food giant recalled 12 million Shrek glasses last week due to the presence of cadmium in the glasses. Customers originally paid $1.99 or $2.49 for the glasses, depending on whether they bought food with the purchase. For more information, visit McDonald's recall page.